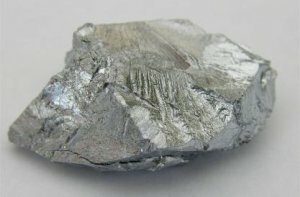 Chromium is a silvery metal used to harden steel. In combination with nickel, it is almost indispensable for the production of good armor plate and of stainless steels. It was also a component of Stellite, one of the hardest and most wear-resistant alloys available in 1941, which was used in the valves and valve seats of internal combustion engines and in the liners of the most sophisticated small arms. It is somewhat expensive (costing $300 a ton in 1941 as ferrochromium, the usual market commodity), but curiously it was one of the few metals produced in any quantity in Japan, at the Hidaka mine. The Allies got most of their chromium from Cuba (177,000 tons a year) and Africa (390,000 tons a year), but there were significant deposits in the western United States; at Masinloc in the Philippines; in New Caledonia; and at Kolar in India. In general, the deposits take the form of a dark band of chromite at the base of an ophiolite. Chromium became a limiting resource for the Japanese late in the war, when the Philippine mines were recaptured by the Allies and domestic supplies proved inadequate. The Japanese were forced to replace chromium steels with high-carbon steels, which were a highly unsatisfactory substitute. For the Allies, the chief difficulty was finding shipping to bring the ore from New Caledonia and Rhodesia, where quantities of chromite piled up on the wharves awaiting transport.